Integrins are heterodimeric transmembrane glycoproteins, each consisting of two noncovalently linked chains, the α and β subunits. Eighteen α and eight β chains have been identified; they combine to form 24 integrin receptor types (1). Cell-matrix interactions mediated mainly by integrins of the β1 family play important roles in embryogenesis and maintenance of the normal structure and function of organs, including the kidney (1). Furthermore, many human and experimental renal diseases are associated with altered expression of integrins (2), pointing to an important role for integrins in the development and/or progression of nephropathies. α8β1 is an integrin receptor expressed by neuronal and mesenchymal cells (3). In the adult kidney, α8 expression was noted in glomeruli and renal arterioles (3). In immunohistochemical studies, we demonstrated that glomerular expression of α8 was restricted to the mesangium in human, rat, and mouse kidneys (4). α8β1 is a receptor for fibronectin, vitronectin, tenascin-C (5), osteopontin (6), and a novel ligand termed nephronectin (7). Mice with a targeted mutation in the α8 integrin chain, with functional loss of the receptor, display impaired kidney morphogenesis, which leads to severe renal defects (8). Approximately 80% of the F1 offspring fail to develop functional kidneys, because of impaired inductive interactions between the ureteric epithelium and the metanephric mesenchyme, and die shortly after birth. The others are born with one or two small kidneys but with apparently normal renal histologic features (8). Inbred α8−/− mice survive at a rate of at least 50% (9). However, because α8 is abundantly expressed in the glomerular mesangium and in renal vessels, it seems unlikely that the lack of α8 does not lead to alterations in kidney morphologic features. We hypothesized that lack of α8 would lead to alterations in the microscopic architectural features of glomeruli and renal vessels or to a compensatory upregulation of other adhesion molecules. To address this issue, we quantitatively evaluated renal morphologic features among α8−/− mice and wild-type control animals and studied the expression of other integrin chains and their ligands. Only male, inbred, α8-deficient (α8−/−) mice with two kidneys were used for characterization of the renal phenotype at the age of 12 wk. α8−/− mice with only one kidney were not included because offspring with one kidney have reached a low frequency (<5%) after 6 yr of α8−/− animal breeding, whereas the percentage of offspring with one kidney was much higher (>20%) at the beginning of breeding. Age-matched, male, C57/BL6 and 129SV mice (Charles River, Sulzfeld, Germany), representing the two founder strains, were used as wild-type control animals. The data obtained for the two control strains did not differ for any investigative procedures; therefore, the data for the two strains were pooled. Ten α8−/− mice and 13 wild-type control animals (eight C57/BL6 mice and five 129SV mice) were used for semiquantitative, morphometric, and stereologic analyses. Eight additional mice per group were used for immunohistologic studies. The lack of α8 in the α8−/− mice was confirmed with Southern blot analyses of DNA and immunohistochemical analyses with the α8-specific antibody. Another five C57/BL6 wild-type control animals underwent uninephrectomy 2 wk before euthanasia, which resulted in a renal mass comparable to that of α8−/− mice, for assessment of the contribution of glomerular hyperfiltration to the phenotype. Also, groups of four 52-wk-old α8−/− and C57/BL6 mice were studied for age-dependent renal alterations. One day before euthanasia, the animals were placed in metabolic cages for 24 h, and urine was collected for determination of albumin excretion. Blood samples were obtained for determination of serum creatinine levels (Autoanalyzer; Hitachi Systems, Munich, Germany). Urinary albumin contents were measured with an ELISA system (Exocell Inc., Philadelphia, PA). With deep anesthesia, the organs of the animals were perfusion-fixed after cannulation of the left ventricle, as described elsewhere (10). The kidneys were removed and one part was embedded in Epon-Araldite. Semithin sections (0.5 μm) were prepared and stained with methylene blue and basic fuchsin. Another part of the kidneys was embedded in paraffin; 2-μm sections were cut and stained with hematoxylin and eosin or periodic acid-Schiff stain. The kidney sections were then morphometrically and stereologically investigated (10). For qualitative electron-microscopic investigations, several ultrathin sections (0.08 μm) were prepared and stained with uranyl acetate and lead citrate. Sections were then examined with a Zeiss electron microscope (EM 107; Zeiss Co., Oberkochen, Germany), at various magnifications. For immunohistologic investigations, kidneys were perfused with ice-cold saline solution and removed. One kidney was shock-frozen in liquid nitrogen, and the other was fixed in methyl-Carnoy solution and embedded in paraffin. Sections (2 μm) were cut with a Leitz SM 2000 R microtome (Leica Instruments, Nussloch, Germany). For vascular casts, kidneys were perfused with ice-cold PBS (containing 1% procaine, 20 U/ml heparin, and 10 mM EDTA), immediately followed by freshly prepared Mercox (0.1 ml of accelerator/5 ml of resin; Mercox is methylmethacrylate produced by the Japan Vilene Co.) (11). Constant pressure was maintained until the resin polymerized. Kidneys were removed and transferred to 15% potassium hydroxide solution for 3 to 10 wk. After tissue digestion, the casts were washed with distilled water, dehydrated with a graded ethanol series, dried in a vacuum desiccator, sputter-coated with 10-nm gold (Balzers Union spattering device; Balzers, Lichtenstein), mounted, and photographed with a Philips XL-30 FEG raster electron microscope (12). Rabbit polyclonal antiserum to α8 integrin was used at a dilution of 1:500, as described previously (4). Monoclonal antibodies to α-smooth muscle actin and proliferating cell nuclear antigen (PCNA) (both from Dako Diagnostika, Hamburg, Germany) were used at a dilution of 1:500, after blocking of endogenous mouse IgG with a MOM kit (Linaris, Wertheim, Germany). Rabbit polyclonal antibodies to fibronectin (Life Technologies, Eggenstein, Germany), collagen I, and collagen III (both from Biogenesis, Poole, England) were used at dilutions of 1:1000, 1:500, and 1:500, respectively, and antibody to collagen IV (Southern Biotechnology Associates, Birmingham, AL) was used at a dilution of 1:1000. Goat polyclonal antibodies to integrins α3, αv, and α2 were from Santa Cruz Biotechnologies (Heidelberg, Germany) and were used at dilutions of 1:500. In deparaffinized kidney sections, endogenous peroxidase activity was blocked with 3% H2O2 in methanol for 20 min at room temperature. Sections were then layered with the primary antibody and incubated overnight at 4°C. After addition of the secondary antibody (1:500 dilution, biotin-conjugated goat anti-rabbit IgG or rabbit anti-mouse IgG; both from Dianova, Hamburg, Germany), staining was performed with a peroxidase detection method, as described previously (13). Each slide was counterstained with hematoxylin. For negative control samples, we used equimolar concentrations of preimmune rabbit or mouse IgG. Staining of cryostat sections was performed as described elsewhere (4), without blocking of tissue with FCS. CY3-labeled anti-rabbit IgG (Dako) or Alexa-488-labeled anti-goat IgG (Molecular Probes, Eugene, OR) was used as the secondary antibody. The glomerular area staining positively for fibronectin was measured with a Leitz Aristoplan microscope (Leica Instruments), with Metaview software (Visitron Systems, Puchheim, Germany), in every third glomerulus per cross-section and was expressed as a percentage of the total glomerular tuft area. Glomeruli staining positively for collagen I were counted and expressed as a percentage of total glomeruli. Renal cortical tissue was homogenized and isolated as described (13). mRNA levels for α2 were detected by reverse transcription-PCR with a TaqMan PCR system (Applied Biosystems, Weiterstadt, Germany), using 18S RNA as a reference and Cyber green as the staining agent. Primers were selected as follows: mouse α2: forward primer, 5′-TGACCAGGTTCTGCAGGATAGA-3′; reverse primer, 5′-AGTAGAAATTGCAGCCACAGAGTAAC-3′; mouse α1: forward primer, 5′-CCAGTCAGCAGCTTCGTTTGA-3′; reverse primer, 5′-TTCCAGTCATAGGCTCCCACAG-3′. Real-time PCR was performed and relative mRNA levels were calculated as described (14). For glomerular geometric assessments, periodic acid-Schiff- and hematoxylin/eosin-stained paraffin sections were investigated with light microscopy: Briefly, glomerular geometric features were analyzed as follows. Volume densities (VV) of the glomeruli and cortex were measured with the point-counting method (according to the principle PP = AA = VV), on hematoxylin/eosin-stained sections at a magnification of ×200 (15), and were corrected for tissue shrinkage (PP, point density; AA, area density). In addition, the number of glomeruli per cortex (NA) was assessed with a model-based approach, using the Weibel-Gomez procedure (16). The number of glomeruli per volume (NV) was calculated with the formula NV = k/β × NA1.5/VV0.5, with k = 1.04 and β =1.38. The total number of glomeruli (NGlom) was derived from the total volume of the renal cortex (VCortex) and the number of glomeruli per cortex volume, i.e., NGlom = NV × VCortex. The total glomerular volume (VGlom) was calculated with the equation VGlom = VVGlom × VCortex, and the mean glomerular tuft volume (vGlom) was determined with the equation vGlom = VGlom/NGlom (15) (VVGlom, volume density of glomeruli). For quantification of glomerular matrix expansion in periodic acid-Schiff-stained kidney sections, scores of 0 to 4 were used, as described previously (13). For assessment of the extent of glomerular widening, indicating the formation of glomerular microaneurysms, scores of 0 to 4 were assigned as follows (17): 0, no capillary widening in the glomerular tuft; 1, capillary widening involving up to 25% of the glomerular tuft; 2, capillary widening of 25 to 50%; 3, capillary widening of 50 to 75%; 4, capillary widening involving >75% of the glomerular tuft. For investigation of glomerular capillarization and cellularity, five semithin sections/animal were investigated by using the point-counting method, with a 121-point eyepiece (Zeiss), at a magnification of ×1000, and oil immersion. Briefly, the length density (LV) of glomerular capillaries was determined according to the standard stereologic formula LV = 2 × QA, with QA being the number of capillary transsections per area of the capillary tuft (18). Glomerular cellularity was stereologically assessed in at least 20 glomeruli/animal. The volume density of the various cell types (VVCell) and the cell density per volume (NVCell) were determined according to the equation NVCell = k/β × NACell1.5/VVCell0.5, with β = 1.5 for podocytes, β = 1.4 for mesangial and endothelial cells, and k = 1 (19) (NACell, area density of cells). The number of cells per glomerulus (NCell) was determined with the formula NCell = NVCell × vGlom. The mean cell volume (vCell) was derived with the equation vCell = VVCell × VGlom/NGlom. Cell proliferation was determined by counting PCNA-positive nuclei in at least 50 glomeruli/kidney section. Staining for α-smooth muscle actin was used for counting of myocytes in all cortical arteries, at a magnification of ×1000, with oil immersion. Furthermore, the length density (LV) of renal cortical arteries was determined according to the equation LV = c × QA, at a magnification of ×100. Briefly, QA was determined as the number of vessels per cortical area. The area and lumen of cortical vessels were determined by using planimetry and a semiautomated image analysis system (Soft Imaging Systems, Muenster, Germany). In all α-smooth muscle actin-stained kidney sections, the minimal and maximal vessel diameters (Dmin and Dmax, respectively) were measured; c was determined as Dmin/Dmax. The vessel area (Avessel) and lumen area (Alumen) were determined with the equations Avessel = π × (Douter/2)2 and Alumen = π × (Dinner/2)2, respectively (Douter, distance from one outer site of the vessel to the opposite site; Dinner, distance from one inner site of the vessel to the opposite site; Dmax, Douter − Dinner at the largest vessel diameter; Dmin, Douter − Dinner at the smallest vessel diameter). The lumen of the vessel was calculated as the difference of the two (19). Serial sections of 0.5 μm were cut from Epon-embedded tissue with a Leica Ultracut E microtome and were stained with toluidine blue (Sigma Chemical Co., St. Louis, MO). Images of the equivalent area of every section (115 to 120 sections) were recorded with a Leica DMR microscope equipped with an F-view camera (Soft Imaging Systems). Sections were aligned and three-dimensionally reconstructed by using the software AutoAligner and Imaris (Bitplane, Zurich, Switzerland). Data are given as means ± SD. The t test was used to determine intergroup differences. The results were considered significant if the probability of error (P) was <0.05. At the age of 12 wk, α8−/− mice had slightly higher body weights, compared with wild-type control mice (26.3 ± 3.4 versus 24.2 ± 2.2 g, P < 0.05). As described previously, the relative kidney weights of α8−/− mice were significantly lower than those of wild-type mice (Table 1). The total kidney volume of α8−/− mice was approximately one-half of that of wild-type animals (123.1 ± 19.5 versus 211.0 ± 19.2 mm3, P < 0.001). The reduced renal mass was correlated with a reduced number of glomeruli per kidney (5413 ± 2512 glomeruli/kidney for α8−/− mice versus 11,537 ± 2568 glomeruli/kidney for wild-type mice, P < 0.001). Neither serum creatinine levels nor albumin excretion differed between α8−/− and wild-type mice (Table 1). The mean glomerular volume was significantly greater for α8−/− mice, compared with wild-type control animals (646 ± 148 versus 427 ± 168 × 103 μm3, P < 0.05) (Figure 1). The numbers of podocytes and glomerular endothelial cells were not different in α8−/− and wild-type mice (Table 2). However, the number of mesangial cells was significantly greater in α8−/− glomeruli, compared with wild-type glomeruli (Table 2). Mesangial cells of α8−/− mice were not hypertrophic, as indicated by mesangial cell volume measurements (445 ± 63 μm3 in α8−/− mice versus 437 ± 49 μm3 in wild-type mice, NS). Immunohistologic detection of proliferating cells revealed a significantly greater number of PCNA-positive glomerular cells in α8−/− mice, compared with wild-type animals (5.0 ± 1.3 versus 2.0 ± 0.5 PCNA-positive cells/glomerulus, P < 0.001). Immunoreactivity for PCNA was observed mainly in mesangial cells, whereas other cell types were rarely positive. Furthermore, glomerular matrix expansion was more prominent in α8−/− mice than in wild-type mice (scores of 1.09 ± 0.45 versus 0.55 ± 0.25, P < 0.05). Matrix expansion seemed to be attributable to increased deposition of typical mesangial matrix proteins, such as fibronectin (7.2 ± 3.1% of total glomerular area stained in α8−/− mice versus 4.7 ± 1.2% in wild-type mice, P < 0.05) and collagen IV (12.11 ± 4.15% of total glomerular area stained in α8−/− mice versus 8.53 ± 4.22% in wild-type mice, P < 0.05), but also resulted from de novo expression of matrix proteins not typical for normal glomeruli, such as collagens I and III (Figure 2). In α8−/− mice, 14.0 ± 8.2% of glomeruli were collagen I-positive, whereas only 1.2 ± 0.7% of glomeruli in wild-type mice revealed faint staining for collagen I. In addition, the abundance of other glomerular integrins was investigated. Immunodetection of αv and α3 revealed localization predominantly in podocytes (Figure 3, C to F), with no differences between wild-type and α8−/− mice. In contrast, α2 integrin immunoreactivity seemed stronger in glomeruli of α8−/− mice, compared with wild-type mice (Figure 3, G and H). Immunohistochemical analyses in serial sections of glomeruli from α8−/− mice revealed partial colocalization of collagen I and α2 integrin, with a mesangial distribution. To confirm the greater glomerular α2 abundance in α8−/− mice, renal cortical α2 mRNA expression was evaluated with real-time PCR. Glomerular α2 mRNA expression was significantly greater in α8−/− mice than in wild-type mice (Figure 4). Renal cortical expression of mRNA for another collagen receptor, α1 integrin, was not greater in α8−/− mice than in wild-type mice, as revealed with real-time PCR (data not shown). Figure 1. Glomerular histologic features of α8−/− mice. Glomeruli of α8−/− mice were enlarged, with hypercellularity and mild expansion of the mesangial matrix. Glomeruli of aged α8−/− mice (52 wk of age) displayed marked capillary widening. WT, wild-type. Figure 2. Immunohistochemical detection of collagens I and III in glomeruli of α8−/− mice. (A and B) Staining for collagen (Coll) I in renal sections from wild-type (WT) (A) and α8−/− (B) mice. (C and D) Staining for collagen III in renal sections from wild-type (C) and α8−/− (D) mice. Only glomeruli of α8−/− mice were reactive for collagens I and III (arrows). (E and F) Staining for collagen IV in renal sections from wild-type (E) and α8−/− (F) mice. Figure 3. Immunohistochemical detection of integrins in glomeruli of α8−/− mice. 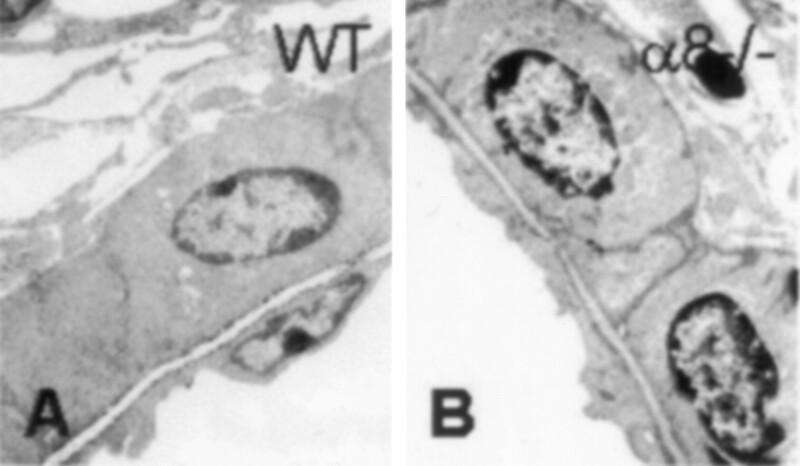 (A and B) Staining for α8 in renal sections from wild-type (WT) (A) and α8−/− (B) mice. (C and D) Staining for αv in sections from wild-type (C) and α8−/− (D) mice. (E and F) Staining for α3 in sections from wild-type (E) and α8−/− (F) mice. (G and H) Staining for α2 in sections from wild-type (G) and α8−/− (H) mice. 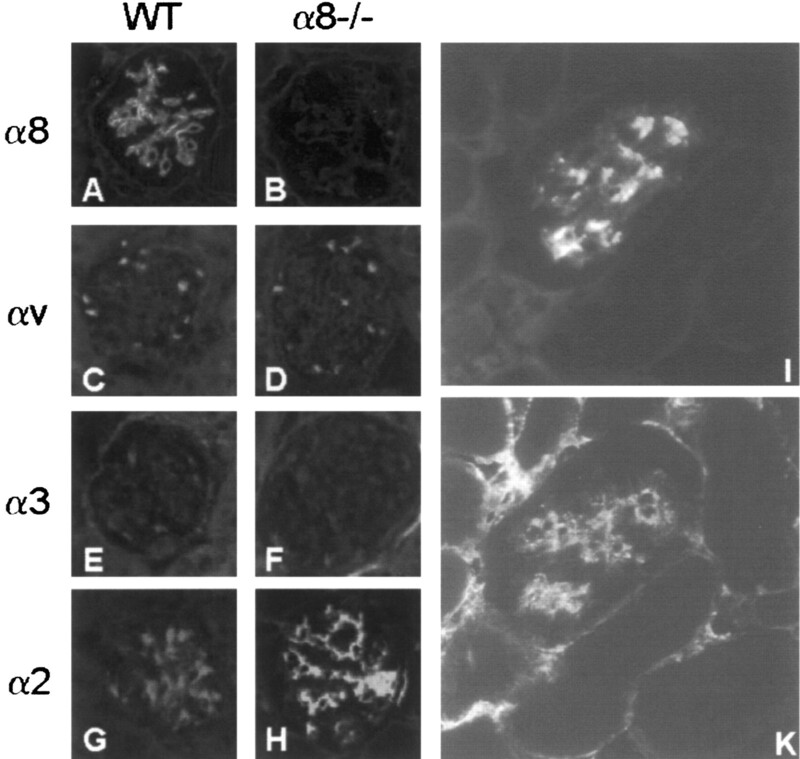 α8 was not detected in glomeruli of α8−/− mice. α3 and αv were detected in podocytes of α8−/− and wild-type mice, with comparable patterns. α2 was detected in mesangial cells of wild-type mice, and staining was more intense in α8−/− mice. (I and K) Detection of α2 (I) and collagen I (K) in serial sections of α8−/− glomeruli, demonstrating partial colocalization of the receptor and its ligand. Figure 4. Real-time PCR analysis of α2 integrin mRNA expression in α8−/− mice. α2 integrin mRNA expression was significantly greater in the renal cortex of α8−/− mice, compared with wild-type (WT) mice. *P < 0.001 for α8−/− versus wild-type mice. For assessment of the contribution of glomerular hyperfiltration to the phenotype, unilateral nephrectomy was performed in wild-type mice, to adjust for the reduced renal mass in α8−/− animals. The mean glomerular volume of uninephrectomized mice was greater than that of untreated wild-type mice but less than that of α8−/− mice (Figure 5A). Glomerulosclerosis in α8−/− mice was comparable to that in uninephrectomized wild-type mice, with both being greater than that in untreated wild-type mice, as assessed by scoring (Figure 5B). However, the number of mesangial cells in the uninephrectomized control group (123 ± 19 cells/glomerulus) was not different from that in untreated wild-type mice but was significantly different from that in α8−/− mice (Figure 5C). Taken together, these findings indicate that the decreased renal mass of α8−/− mice might account for glomerulosclerosis but not for the increased mesangial cell numbers. Figure 5. Contribution of uninephrectomy to glomerulosclerosis and glomerular hypercellularity. Mean glomerular volume (A), glomerulosclerosis (B), and mesangial cell number (C) were compared for wild-type (WT), uninephrectomized wild-type (WT-UNX), and α8−/− mice. *P < 0.05. Age-dependent glomerular alterations were studied in 52-wk-old α8−/− and wild-type mice. Glomerulosclerosis in aged mice was significantly greater than that in 12-wk-old mice, for both α8−/− mice (score, 1.63 ± 0.22) and wild-type mice (score, 0.89 ± 0.15). In light- and electron-microscopic analyses, glomerular capillaries of 12-wk-old α8−/− mice did not demonstrate any alterations, compared with wild-type mice (Figures 1 and 6⇓). Scores for capillary widening, indicating microaneurysm formation, were comparable for glomeruli of α8−/− and wild-type mice (0.29 ± 0.11 versus 0.25 ± 0.14, NS). In stereologic analyses, however, some minor alterations became apparent. Capillary length density (LV), as a measure of three-dimensional glomerular capillarization, was slightly but significantly higher in α8−/− mice, compared with wild-type mice (12,614 ± 1207 versus 11,210 ± 1181 mm/mm3, P < 0.05). In contrast, marked capillary widening was detected by scoring in glomeruli of aged α8−/− mice; widening was significantly greater (score, 0.51 ± 0.10) than that in younger α8−/− mice (Figure 1), which was not the case for wild-type mice (score, 0.24 ± 0.14). Figure 6. Vascular casts and three-dimensional reconstruction of the peritubular capillary network. The peritubular capillary network was studied by using vascular Mercox casts (A and B) and three-dimensional reconstruction of 0.5-μm serial sections (C) of the cortical vessels. In wild-type (WT) mice (A), round/oval capillaries possessing small sinusoid-like segments (arrow) were observed. In α8−/− mice (B and C), these sinusoid-like segments (arrows) were significantly widened and surrounded the tubules (asterisks). In the three-dimensional reconstruction of 120 sections of Epon-embedded tissue (C), xy, xz, and yz sections of the block are indicated. The positions of the sections are indicated by the lines. Bars = 50 μm. The number of myocytes per arterial vessel cross-section tended to be higher in α8−/− mice, but this difference was not significant (2.9 ± 0.7 myocytes/cross-section in α8−/− mice versus 2.3 ± 0.5 myocytes/cross-section in wild-type mice, NS). Wall thicknesses of the cortical arteries were not significantly different (8.4 ± 1.4 μm in α8−/− mice versus 9.1 ± 1.5 μm in wild-type mice, NS) (Figure 7). The total number of vessels per cross-section in the renal cortex tended to be lower in α8−/− mice than in wild-type control mice, without reaching statistical significance (125 ± 26 vessels/mm2 in α8−/− mice versus 150 ± 21 vessels/mm2 in wild-type mice, NS). Arterial length densities were comparable in the two groups (6.25 ± 1.64 mm/mm3 in α8−/− mice versus 6.78 ± 2.04 mm/mm3 in wild-type mice, NS). Figure 7. Electron-microscopic analysis of the arterial vessel walls of the renal cortex of wild-type (WT) and α8−/− mice. Cortical vessel walls were not significantly different in α8−/− mice (B), compared with wild-type mice (A). Magnification, ×3000; ultrathin sections. Cortical tubules are surrounded by the peritubular capillary network. In wild-type mice, these capillaries were not completely round but were slightly widened and contained small sinusoid-like segments, as demonstrated in vascular casts (Figure 6A). In α8−/− mice, these sinusoid-like segments were considerably larger, forming sheet-like structures. They were observed between the tubules, surrounding them (Figure 6B). To verify that these alterations were not attributable to filling artifacts, serial sections of Epon-embedded kidneys were used for three-dimensional reconstruction of the peritubular capillary network. Using xy, xz, and yz sections, the same enlarged sinusoid-like capillaries were observed in α8−/− mice (Figure 6C). Analysis of the renal phenotype of adult α8−/− mice was performed to gain insight into the role of α8 in the glomeruli and the renal vasculature. This study confirmed that mice lacking α8 had greatly reduced renal mass, with reduced nephron number. Glomeruli were enlarged and hypercellular. There was mild glomerular matrix expansion, characterized by the de novo appearance of collagens I and III. However, there was no gross functional impairment of the glomeruli in those mice. The α8 integrin chain is expressed in glomerular mesangial cells and smooth muscle cells of the renal vasculature (4). In addition to its ability to influence epithelium-mesenchyme interactions during growth and branching of the ureteric bud, integrin α8 could thus have some effects on normal glomerular and renal vascular structure. However, the observed alterations were minor and did not lead to obvious impairment of glomerular function. This finding was surprising, given the prominent mesangial and vascular expression of α8. Renal mass was significantly lower in α8−/− mice than in wild-type control animals, because of significantly reduced nephron number. Similar observations were made in mice with a targeted deletion of glial cell line-derived neurotrophic factor (GDNF) (20). Mice that are homozygous for the GDNF mutation die as a result of renal failure shortly after birth, whereas heterozygous mice survive with variable renal defects. Comparable to α8−/− mice, GDNF-heterozygous mice exhibit reduced renal mass, with unilateral agenesis, smaller kidney size, abnormal kidney shape, and reduced nephron number. In those mice, growth and branching of the ureter are frequently impaired, similar to the deficiencies observed in α8−/− mice (21). Like α8, GDNF is synthesized in the metanephric mesenchyme during renal development (22), suggesting that interactions of α8 with its ligand could be involved in signaling pathways with GDNF. However, unlike α8−/− mice, which compensate for the reduced nephron number by increasing the mean glomerular volume, presumably to maintain the GFR, GDNF-heterozygous mice exhibit normal-sized glomeruli, with no hypertrophy (20). Mice with targeted gene deletions have been generated for most of the known integrin chains (1). In addition to α8−/− mice, however, only α3 integrin-deficient mice were demonstrated to display an overt renal phenotype. α3 is predominantly expressed on the basal surfaces of podocytes. A lack of α3 leads to abnormal differentiation of podocytes and a disorganized glomerular basement membrane (23). Like α8, α3 seems to be involved in branching morphogenesis, inasmuch as mutant kidneys demonstrated decreased branching of collecting ducts. The mesangium, however, appeared normal in α3-deficient mice. In α8−/− mice, podocytes and the endothelium were of normal appearance, whereas the mesangium was affected. In this study, hypercellularity was restricted to mesangial cells. This phenomenon was not attributable to the smaller renal mass of α8−/− mice, because uninephrectomized wild-type mice demonstrated a comparable renal mass but did not exhibit mesangial hypercellularity. Therefore, it remains unclear whether this phenomenon is attributable to the ability of α8 to directly inhibit cell proliferation or to secondary mechanisms. Taking into account the fact that α8 is expressed solely on mesangial cells in glomeruli, we speculate that α8 is involved in the regulation of mesangial cell proliferation. It remains unclear, however, why the lack of α8 in smooth muscle cells of renal arteries has no effect on the cellularity of the arterial wall. Other integrins, such as α5 and αv, are coupled to mitogenic pathways, leading to the activation of mitogen-activated protein kinases (24). No data exist regarding intracellular signaling events after the activation of α8 with ligand binding. Mesangial matrix expansion in α8−/− mice seems to be largely attributable to glomerular hyperfiltration, as a consequence of reduced renal mass. Adapting the renal mass of wild-type mice to that of α8−/− mice with uninephrectomy revealed that the glomeruli of α8−/− mice were sclerotic to a similar degree, compared with the glomeruli of uninephrectomized wild-type mice, in agreement with previous data (17). Mesangial matrix expansion in α8−/− mice is attributable to an increased abundance of typical mesangial matrix proteins, such as fibronectin and collagen IV, but also to de novo expression of collagens I and III, which are primarily associated with fibrotic alterations. However, the fact that the glomerular capillary length density in α8−/− mice is greater than that in wild-type mice argues against severe sclerotic alterations of the glomeruli, which usually lead to capillary obstruction. Furthermore, collagens I and III were readily detected in glomeruli of newborn mice, indicating that these alterations are not age dependent. The glomeruli of aged α8−/− mice demonstrated increased matrix expansion, compared with the glomeruli of younger α8−/− mice, as was also true for the glomeruli of wild-type animals, but did not exhibit obstructive sclerosis. Several integrins have been implicated in extracellular matrix regulation. In many fibrotic renal diseases, coordinate induction of the synthesis of matrix proteins and integrins (α1 or α5) was observed (2). An antibody to α1 decreased mesangial matrix accumulation in a rat model of glomerulonephritis (25). Overexpression of α1β1 in mesangial cells led to reorganization of the extracellular matrix (26). There are few data available regarding the involvement of α8 in fibrogenesis. A study by Levine et al. (27) suggested a role for α8 in the fibrotic responses after lung and liver injuries, because α8 was upregulated in interstitial cells in both organs during fibrogenesis. In addition, α8 was induced in cardiac fibroblasts by angiotensin II and transforming growth factor-β1, suggesting a possible contribution of α8 to cardiac matrix expansion, but this was not studied in detail (28). The results of the study presented here suggest only minor effects of α8 on mesangial matrix expansion. This was supported by our own observations in a model of hypertensive glomerulosclerosis; an increase in α8 expression was observed in the affected glomeruli. However, the lack of α8 did not affect the degree of glomerulosclerosis, because wild-type and α8−/− mice displayed the same levels of glomerular matrix expansion (17). Unlike wild-type mice, α8−/− mice developed widening of the glomerular capillary tuft with age. Therefore, α8 seems to be important for maintaining the integrity of the capillary structure in glomeruli. This assumption is supported by previous findings demonstrating greater susceptibility to capillary tuft disruption after mechanical strain in α8−/− mice, compared with wild-type mice (17). The relatively mild glomerular alterations, especially in young α8−/− mice, support the concept that the lack of α8 can be compensated for in the glomeruli. Other integrins binding the main glomerular ligand for α8, i.e., fibronectin, seemed to be the best candidates for such compensatory mechanisms. However, our data argue against contributions of αv and α3, which are expressed mainly in epithelial glomerular cells and do not seem to be induced in α8−/− mice. We were unable to detect α5 in the glomeruli of mice, which leaves open the possibility that α5 could compensate for the lack of α8; however, mesangial cells isolated from α8−/− mice did not express greater amounts of α5 mRNA or protein than did mesangial cells from wild-type mice (29). Therefore, none of the integrin chains investigated was a good candidate to replace α8. Detection of the atypical collagens I and III in the glomeruli of α8−/− mice led to the speculation that compensation for α8 function could involve interactions of those collagens with collagen receptors. This idea is supported by the observation that the collagen-binding integrin α2 is more abundant in the glomeruli of α8−/− mice, compared with wild-type mice. However, there are no mechanistic data to prove this concept. Cell-matrix interactions are obviously strong enough to maintain the structural integrity of glomeruli in unstressed α8−/− mice. However, if the glomeruli are exposed to an additional challenge, such as mechanical stress or age, then the compensatory mechanisms cannot prevent more severe glomerular lesions in α8−/− mice (17). No apparent alterations in the architectural features of cortical arteries or glomerular capillaries of α8−/− mice were detected. The only vascular abnormalities in α8−/− mice were observed in the capillaries of the peritubular network; the capillaries were widened and formed sheet-like structures. It is not known why the capillaries form abnormally, but impaired vascular branching during renal development in α8−/− mice could be involved. In many of these mice, we observed segmental renal malformations, with retraction of the cortical surface, also pointing to possible vascular defects (9). These findings indicate that the lack of α8 in glomeruli and renal arteries can be largely compensated for. However, some renal abnormalities, such as mesangial hypercellularity attributable to dysregulation of mesangial cell proliferation, remain apparent, suggesting an important role for α8 in mechanisms regulating cell growth. Disruption of the integrity of the glomerular capillary tuft in aged α8−/− mice suggests a role for α8 in the maintenance of glomerular structural integrity. This article is dedicated to the memory of Prof. R. Bernd Sterzel, who died August 6, 2001. This study was supported by the Deutsche Forschungsgemeinschaft (SFB 423, A2, and B8), the Swiss National Science Foundation (Grants 3100.55895.98 and 3100.068256.02), and an ELAN grant from the Faculty of Medicine, University of Erlangen-Nürnberg. The expert technical assistance of Catherine Allemann-Probst, Elisabeth Buder, Hans Fees, Monika Klewer, and Renate Lissner is gratefully acknowledged.